teddy bear picnic day | The Loudest Librarian! Teddy Bear Picnic Day is July 10 (who thinks these things up, and how do I get that job? ), so this week I did a Teddy Bear storytime. Year ago, when I was working at the Woodside Library, we used to do a Teddy Bear Picnic every year. The kids would bring a favorite stuffed animal, and we would read teddy bear stories, sing songs, and hold a contest where every stuffed animal received an award (softest bear, silliest bunny, and my favorite (for the tattered ones)…most loved). We even had a teddy bear doctor, who would give each animal a check-up. This was always hilarious, because the kids would present all kind of symptoms: “My bear has a fever.” “My bunny has a stomach-ache.” “My Spiderman was shot!” My coworker would examine each animal, and write them a prescription, like “Give three hugs each day.” Then we would serve Teddy Grahams and apple juice, and send them on their way. It was always a highlight at the end of summer. 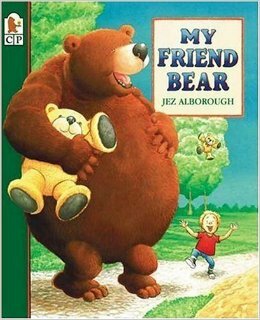 My friend Kerri Hall shared this book with me when we were in library school at UNC, and I’ve loved Jez Alborough ever since. It’s a rhyming story about a boy named Eddie, who has lost his teddy, Freddie. While nervously searching through the forest, he finds his teddy bear, only to discover that he’s grown to an enormous size. But then a giant bear appears, moaning that his teddy bear has suddenly shrunk. The boy and the bear are equally terrified to see each other, and both grab their own teddy bears and run “all the way back to their snuggly beds, where they huddled and cuddled their own little teds.” The rhymes are so catchy, I can almost recite this book by heart, and the illustrations are large, and adorable. The page with the frightened bear and boy always gets a laugh. I was planning to read That Rabbit Belongs to Emily Brown by Cressida Cowell, but the kids seemed to enjoy Where’s My Teddy? so much that I decided to read the sequel (actually it’s the third book in what is actually a picture book trilogy with It’s the Bear, but I’ve read it often as a stand-alone). In this one, Eddie is walking in the woods with Freddy, and wishing his teddy bear could talk. Once again, he sees the giant teddy bear, but this time he knows who its owner is. Sure enough, along comes the bear, and frightened, Eddie hides behind the big teddy. This leads to a misunderstanding, where the bear thinks his teddy bear can talk, and after sorting all that out, the boy and the bear end up becoming friends. It’s funny, like the first book, but also sweet, and the ending got a few “Awws” from the parents. This is one of my favorite picture books, and one that would work well for a letter-writing theme. Katie is terrified of the bear she is sure is living in the closet under the stairs. She tells her mother, who suggests that she write the bear a letter and tell him to go away, which she does. She is surprised to receive a letter back from the bear, thanking her for the suggestion because he needs a vacation. When he comes back, he leaves a present for Katie outside the closet door. The two exchange letters back and forth, until finally the bear invites Katie to a tea party under the stairs. Nervously, she accepts, but when she arrives, she finds, not a big scary bear, but a large friendly teddy bear. 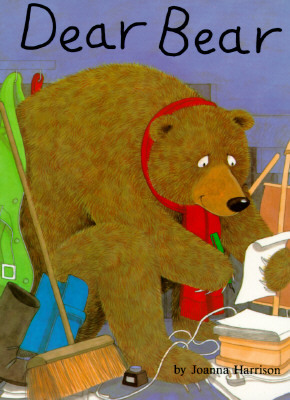 One of the kids asked how the bear could write letters, and then sagely said, “Maybe her parents wrote the letters.” The book definitely hints at this, although it never says it outright. One of my all-time favorite books from my own childhood, and one I still love to read. It’s such a simple story, about a department store teddy bear who loses the button to his overalls, and goes on a quest to find it. The humor of Corduroy’s interpretation of the world is timeless: the escalator is “a mountain,” the mattress department is “a palace.” Of course, most mattresses nowadays don’t have the “buttons” on the top that Corduroy mistakes for his own missing button. But it’s still one of the few picture books I know that depicts a family in an apartment instead of the typical suburban house, as well as featuring a beautiful African-American girl who saves the day by adopting Corduroy from the store. (Incidentally, I stumbled across this blog post by Lisa Rosenberg, the real-life inspiration for Corduroy’s Lisa). There’s been a lot written recently about the lack of diversity in picture books. I’m acutely aware of that here in the Bay Area, where most of my storytime audiences look nothing like the kids in the books I’m reading. 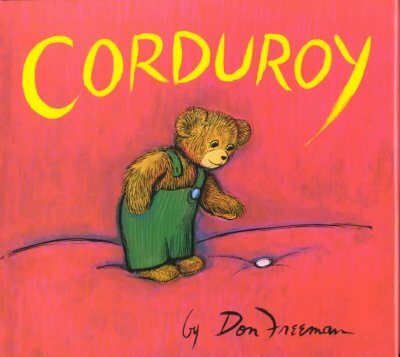 Corduroy does a wonderful job of creating a lovable, classic story while silently conveying the message that children come in all different shades and backgrounds, and any of them can be a hero. Plus I always get choked up on the last page. We’re coming to some grass. (We’re coming to some grass). Have to go through it. We’re coming to some mud. (Have to go through it). Squilch! Squelch! Squilch! Squelch! (Clapping hands together). We’re coming to a lake. Have to swim across it. We’re coming to a cave. Two yellow eyes…it’s a bear! We’re never going on a bear hunt again! This is great song by John Walter Bratton, with lyrics by Jimmy Kennedy. The best ukulele version I’ve found is on Doctor Uke (http://www.doctoruke.com/teddybearspicnic.pdf). It’s kind of a tricky song to sing because of the chord change. My favorite version by far is the one by Jerry Garcia, which you can listen to here: https://www.youtube.com/watch?v=67Mowhcj8OM. The biggest challenge with this was finding a way to stick the pompoms together. I gave the kids tacky glue, which worked okay, but I’d love any suggestions on the best way to attach pompoms. 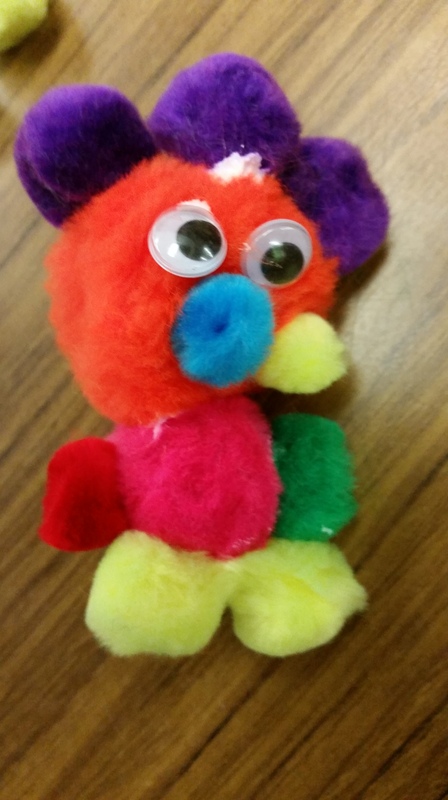 It was still a fun craft, and I loved the way the creatures came out. I was hoping to read this book, but unfortunately our branch’s copy was out, and the one I ordered from another library didn’t arrive in time. 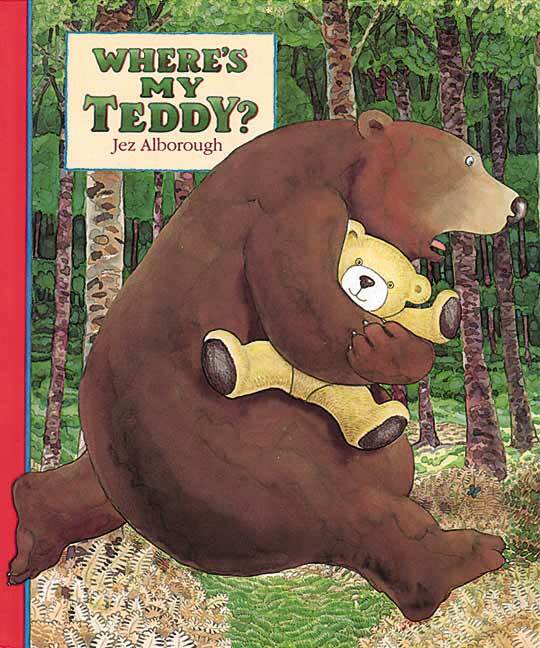 It’s a great story about a little girl who is looking for her lost teddy bear. Her mom tells her to think like a detective, and the hunt begins. I especially love her sister’s suggestion that sometimes when you throw another stuffed animal, it will find the lost one (I actually tried that in the park once when my son lost a Lego R2D2, and it actually worked!). I didn’t read this one because I shared it fairly recently, but of course I have to include it in my list of favorite stuffed animal stories. When Trixie (who is too young to talk) goes with her dad to the laundromat, she loses her beloved Knuffle Bunny. 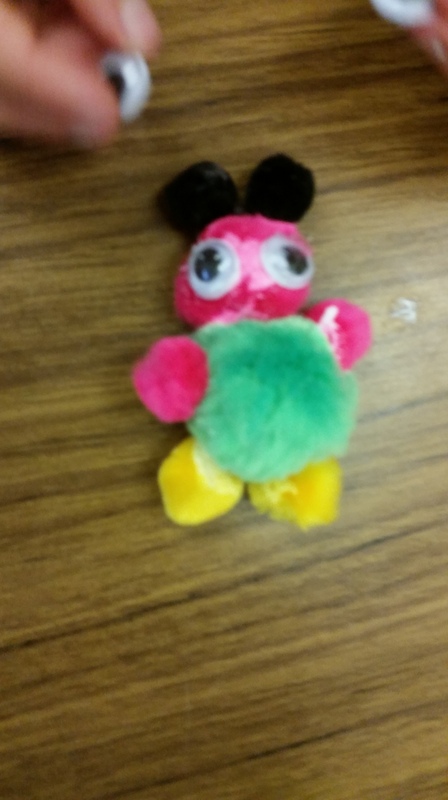 She tries everything she can to make her Daddy understand that Knuffle Bunny is missing, including going boneless, but he just doesn’t get it. Luckily, Trixie’s mom knows exactly what’s wrong, and the whole family rushes back to the laundromat. I meant to read this one, although I can’t do it nearly as well as my former boss, Thom Ball. Emily loves her stuffed rabbit, Stanley. Unfortunately, Queen Gloriana also has her sights set on Stanley, even though Emily refuses to give him up. Finally, the Queen kidnaps Stanley, but complains that he no longer looks happy. So Emily teaches her the secrets of having a happy toy companion of her own. I like this one for toddler storytime. Willy loves his toy monkey, Bobo, but so does Earl the cat. A simple story with funny illustrations, as Willy has to constantly search for Earl’s latest hiding place. What are your favorite books about stuffed animals?